The tree features flowers of all shapes, sizes and colors, a decorative watering can tree topper, as well as 13 hand-drawn and framed flowers created by Abshire and Haylan’s goldsmith and designer, Belinda Vartenuk. The 3-woman team, including Decker-Holmes, Vartenuk and Lori Decker, was strategic in its design approach. “We just hope that in creating this tree we give whoever has the privilege of owning it and seeing it in their home throughout the holiday season the joy and happiness it has brought to us,” added Decker-Holmes. 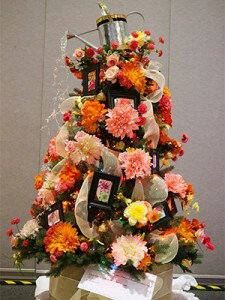 Visit the 33rd annual Holiday Tree Festival at the John S. Knight Center from Nov. 22 –Nov. 30, and see the trees, wreaths and holiday gifts. Admission to the festival is free. For more information, click here.